In Salesforce Spring’14 release Salesforce introduce Data Import wizard, that’s provides a unified interface that lets you import data for a number of standard Salesforce objects, including accounts, contacts, leads, and solutions. The wizard also lets you import data for custom objects.You don’t have to pick and choose between different wizards in Setup anymore. Now you can do it all in one place. This feature available in Developer, Performance, Enterprise, Professional, Contact Manager, Group and Unlimited editions except Database.com. Note :- The separate import wizards for accounts, contacts, leads, solutions, and custom objects are still available. Below are the list down major difference between existing wizard and Data Import Wizard. Here we will update Account Name for three accounts, so I created a CSV. the file look like the below image. 1) Click on Name | Setup | Administration Setup | Data Management | Data Import Wizard. 2) Click on Launch Wizard!” button. 3) It will redirect you to a new page, Where you have to choose the Type of object data you want to import (In our case it’s account object). In the image, you can see the progress bar also moving as you selected the object. 5) choose a source file (You can drag and drop a file or browse ) for your data and Click on Next button. 6) Map the fields that need to be mapped, To map the field click on “Map” link, it will populate a window where you can map field (You can map one field with more than one fields). In our case mapping look like below screenshot. Once you are done with mapping click on the Next” button. 7) It will redirect you to “Review & Start Import” screen, If you are good to go ahead then click on “Start Import” button. This Screen will show all details about mapped fields and unmapped fields. 8) Once it’s successfully completed you will get, Pop up with Success message something like below screenshot. Data Import Completed you will also get an Email from Salesforce with Success and failure details. 9) Once you click on “OK” button on Success message it will redirect you to a “Bulk Data Load Job” window, where you can able to find all details about last data Import. To verify account name, go to Account tab and check as you want. Below is the screen shot for my case it’s updated as we used in csv file. If you like this blog or you have a question please leave your comments, I’ll try to answer it. Thanks for your time to read my article. I am a system administrator so we are unsure of what permissions I need. Is there a log somewhere that can show which records did not import? nevermind- I see the problem is in my permissions- I will contact my admin – thanks anyway! 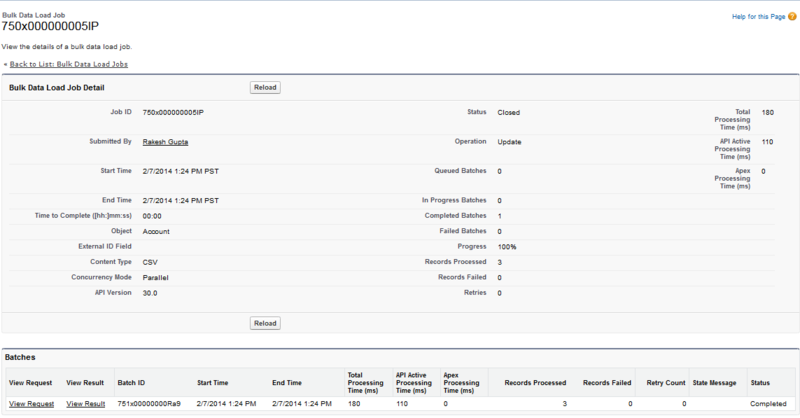 In my account (Salesforce 14) there is no import wizard under Data Management – only Analytic Snapshots and Sandboxes. Any ideas why or where it may be? THanks! 3. Job resume/retrieval – what if I want to save this job for future use, can I save the job and resume it later at any time once logged in back . 4. Does it take backup before making changes, do we receive sort of data recovery file, what if we mess, how do you recover ? 7. API call limit set (How can I set batch size, as this may cause an issue to my trigger and may error out ) when ran in bulk ? 1. As you mentioned in previous comment, every thing we have to do in excel. This is very limited version. 2. No, you can’t schedule job for future run, may be Salesforce add this feature in next release. 3. I don’t think, there is no such option. 5. Yes I am also agree with you. Hope see this feature on next summer’14 release. 6. We can’t set this in Data Import wizard, I know only Data loader where we have this option. Did I miss whether the data import wizard will allow duplicates or not? No, It won’t allow duplicates based on ID or Name. 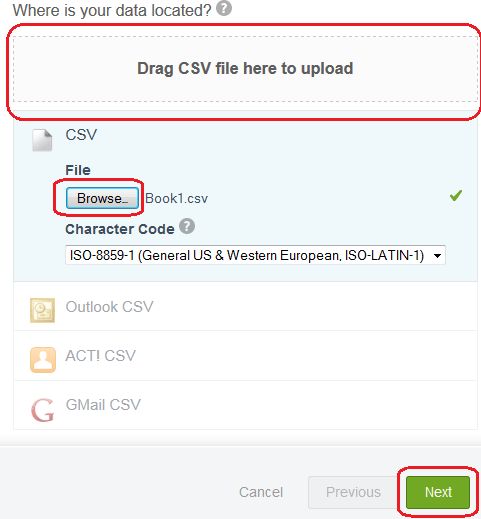 like example if you have a .csv that contain three records with same name. when you will use this file with Data import wizard select “Match Account by” account name so it will insert only one record in Salesforce. Let me know if you still have a query. Thank you. And if the Account already exists but you are adding a new contact to that account, do you need the account ID or will it match it? In that case you have to provide Account ID. I import lists from events so often I will not know how many, if any of the contacts on a given list are new or existing contacts. I am trying to avoid exporting and doing a vlookup on each import. But is that was true Salesforce Admins need to do? 1. Will Existing Wizard removed ? 2. What is the advantages compare to Existing Wizard ? 3. How about compare to Data Loader and dataloader.io ? 2. Streamline user interface that makes uploading data files and mapping easier then ever. You can drag an drop file here too. 3. Salesforce administrator can import upto 50,000 records at a time, Other user can import 5,000 records at a time.